Throughout a long season and career, endurance athletes put an incredible amount of stress on their muscles, joints and soft tissue. While the movements required for a given sport are similar between competitors, how a specific athlete handles the load can differ greatly. Understanding how your unique body moves and adapting your approach can be key to success, longevity and injury prevention. A Functional Movement Screen™ can help. A Functional Movement Screen™ is a test delivered by a licensed coach that takes an athlete through a series of seven basic movements to map out how their body behaves. These include asking the athlete to squat, twist, push, pull and bend. The test uses light weights and is most concerned with form and alignment of the upper and lower body. The assessor will look for tightness, weakness and compensation through each movement with a focus on defining potential issues. These are related to how an athlete balances and adapts to the specific demands of the task. The assessment is not difficult, but can provide great insight. Many factors influence how an athlete completes the core movements of the screen. These include injuries (past and present), age, lifestyle, genetics and many more. In short, you are uniquely you and how you handle load through movement is different than anyone else. 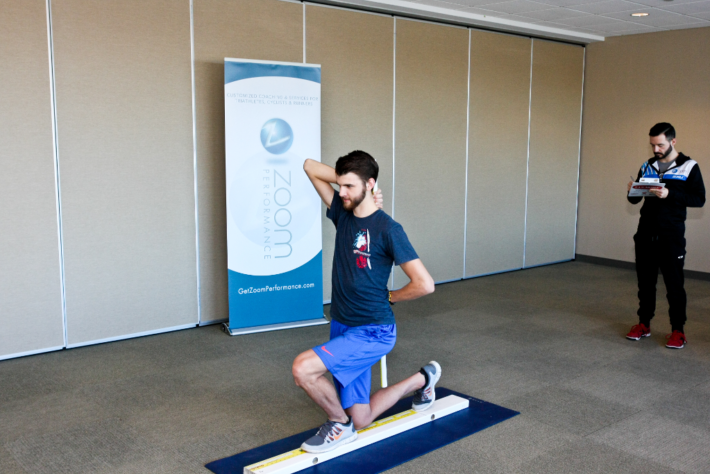 When is a Functional Movement Screen™ most beneficial? The deficiencies and opportunities uncovered by the assessment will require tweaks to training, equipment and approach. This could mean new or different strength training, modifications to technique, equipment or others. Implementing changes like these are helpful any time. Be that in the offseason or during the rigors of a competitive season. The Functional Movement Screen™ is being offered now to help athletes gear up for a successful 2017. In addition, Zoom Performance is also offering a variety of additional assessments addressing mechanics, nutrition and strength testing. All will be customized to your specific situation and discipline. The January calendar for all is filling fast and capacity is limited, so if you are interested, please contact your coach for more information.